Finally, Graceling is a finalist for the Indies Choice Book Awards in the category of Best Indie Young Adult Buzz Book. These awards are presented by the American Booksellers Association. My fellow finalists are The Graveyard Book, by Neil Gaiman; The Hunger Games, by Suzanne Collins; Little Brother, by Cory Doctorow; My Most Excellent Year, by Steve Kluger; and Savvy, by Ingrid Law. I know I'm starting to sound like a broken record, but, hello. Good company! That's the news. Before I get to the pretty picture, Melissa Marr is giving away some free books this month, including 3 signed copies of the U.K. edition of Graceling. Go here to enter the drawing! Also, one more thing: everyone I know seems to be sick right now. Everyone is sick! So this is just a wish that everyone feel better! Feel better soon, everyone! And now, here's the pretty picture. It's the cover for the Fire ARC in the USA and Canada (Dial Books for Young Readers, Fall 2009). The cover for the final book may be different from the ARC cover. As always, feel free to tell me what you think. I made sure to post the Graceling cover above so you could compare if you want. Congrats on all the nominations, and on a fantastic debut book!! My son and I both read Graceling, me over the weekend and then I insisted he read it too (he's 13.) We both loved it! You deserve as many accolades as you can garner! The cover for Fire is beautiful. I'm usually one who goes for full scene covers, but the covers of Graceling and Fire both evoke a strong reaction from me with their simplicity and elegance. I'm eagerly awaiting the release of Fire. A continuous stream of rejection letters from proposed agents has left me bereft of my usually irrepressible optimism and I'm in need of a good story. Oh, and congrats in spades on Graceling's acclaim and position in the running for awards! It deserves it! Gorgeous cover! And congrats on all the nominations, of course. I noticed Fire is under Dial Books, and Graceling was published by Harcourt. I'm guessing this is because Kathy Dawson recently began at Dial, which provokes another question in me--is it the norm for an author to go with their editor from imprint to imprint? Are you two a package deal? Yay for you and all the noms! Love the cover! I cant friggin wait! Love the cover. I can't wait to read it! When I saw the cover for Fire I gasped audibly and said, "Coooool!" Does that convey my thoughts well enough? Bow and arrow = awesome! I love a huntress. Without even blinking an eye I uttered, "ooooooooh, coooooooool!" Congrats on all the nominations! You deserve it. Congratulations on all the nominations!! That is GORGEOUS! I love that cover and how it fits with Graceling as well. So beautiful - can't wait to see it in person! Congrats on the nominations. Loved Graceling. 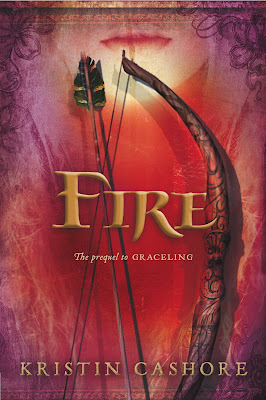 I really like the cover of Fire, but I think it would be better without the face, and it would tie in more with Graceling's cover. the colors are great and I like the arrows. sooo looking forward to reading it. yay a pretty picture!!! u got stiff compition with the jenna fox book. it is reeeeeeeeeeeeeeeeeaaaaaaaaaaallllllllllllly good. i reccomend it as a read. like u dont have enuff. Oh, I LOVE the cover for Fire! I can't wait to read it! Beautiful cover. Congratulations on the awards. Fire is on its way, how exciting for all of us. Hey, thanks, everyone, and I'm so glad you like the cover! It Depends on the Day -- I read Jenna Fox and loved it! I should have said that in my post, actually. I'll have to find a way to work it into a post soon. Love Love Love the cover and can't wait for the book! Thanks for sharing it! Fantastic news, and, indeed, fantastic company. And on the nominations wow! Graceling is up there with some awesome company! You must keep us updated on it! Great cover-looking forward to reading it. Congrats on the noms, they are well deserved. I have been recommending Graceling to everyone I know. Congrats on the award nominations. I also love love love the cover of Fire. I hope that its also the final, that would certainly grab my attention in the store. That cover's gorgeous. Will Bitterblue have a weapon on the cover too? Oh, I think the fire cover is gorgeous. I love it. Congradulations on all the award nominations!!! You TOTALLY deserve them! I like the Fire cover...very mysterious and it makes me want to read the book even more. The colors are good too: Graceling for Katsa's eyes and Fire for, well, the title. And the cover is gorgeous. Do you just love it? That is just beautiful. It goes along with the Graceling cover but seems to speak its own language of a new story. I luuuuv it!!!!! FANTASTIC cover. I love it. It goes right with that of Graceling. I can't wait to get it. That cover rocks! I love the bow and arrows on the cover. congratulations, kristin. and i love that cover. it's stunning! wow! No tour per se, but I'll be doing a few events in the fall that might involve local bookstore stops (none in Kentucky, however -- sorry! ), and as the time nears I'll be sure to make an announcement. At some point I'll probably be adding a "My Schedule" link to the blog -- I'll focus on that project after I get my FAQ page up. that is very pretty picture! Congrats on the award noms. you desereve it all! hope you win!I'm in Ga and if i could vote for your book i so will! Amazing cover by the way! After seen the cover i'm even more excited. I hope my BN gets an ARC!!!! i'm soooooo snatching it if we do! I just finished reading your book Graceling and I loved it. Can't wait for the next one. Odd, my ARC is white and just has FIRE on the cover, no art...Hm. Just minutes after pathetically trying to convince a coworker to shell out the dough and go to BEA with me so I could desperately try to snag an ARC of Fire, I open my mail and find that I won such an ARC (galley?) in a contest. I literally ran around the library grabbing random coworkers and hugging them. I even did a little dance in the circulation workroom! And then I stayed up until 2am that night finishing it. What fun! My copy says that torture awaits those who use it for review (well, it kinda does), so I will only say: you are so creative! And there is to be a third? Yippee!